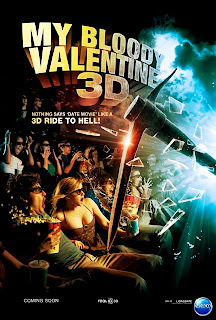 I finished watching My Bloody Valentine, but in 2D this time. It kind of sucked without the 3D gimmick, and I'm glad I was able to catch it in its recommended 3D experience. A lot of the shots done just seem so cheesy, ie. the multiple shots of stuff flying at the screen. Its very obvious that they were done specifically for the 3D effect, but it just comes off as bad when its 2D. Also, the way they shot the movie, without the 3D effect, it looks like another DTV horror flick shot on a bad HD camera. Anyhow, hopefully when its released on DVD, they'll have a 3D version intact, with glasses included. Later geeks.